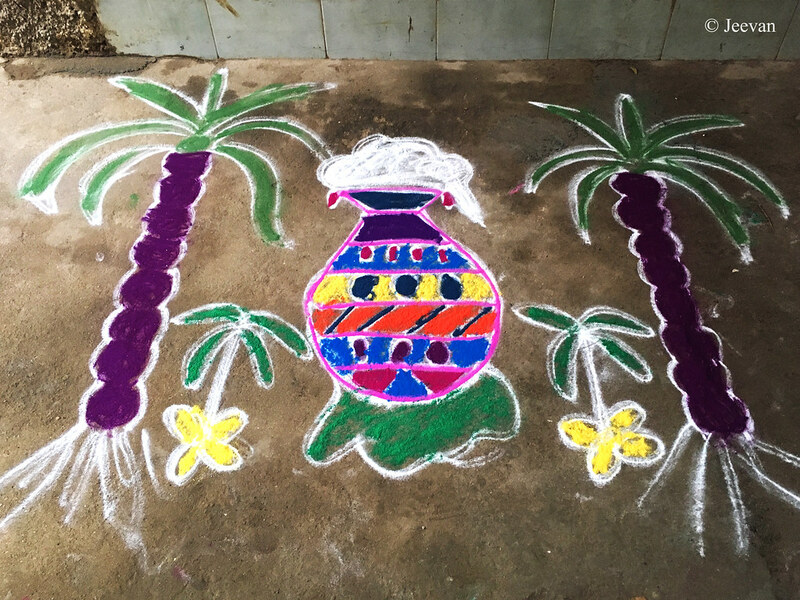 The Pongal pot along with sugarcanes and turmeric plants upon which we made pongal using firewood stove. I don’t think it’s too late to post on Pongal, held last week. As always it was three of us (me, mom and dad) celebrated the harvesting and thanksgiving festival by making Pongal (boiling of rice and milk) at the courtyard using firewood on bricks stove. 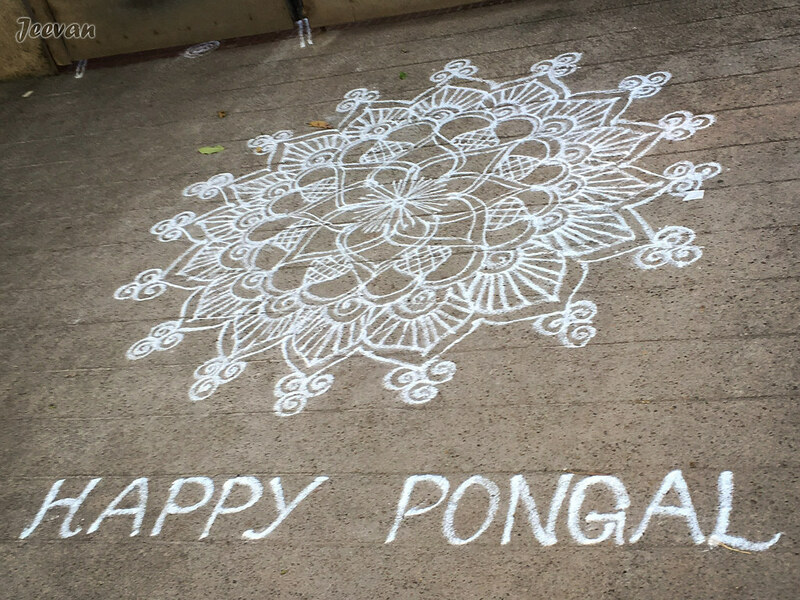 My brother was out of town, though he isn’t interested in festivals general, I love the tradition of making Pongal esp. in mud pot in open space as a sign of thanking the foremost nature source sun. I always feel festivals are to celebrate and it’s an occasion to be happy, at least for a while keeping away things that put us down or race life. 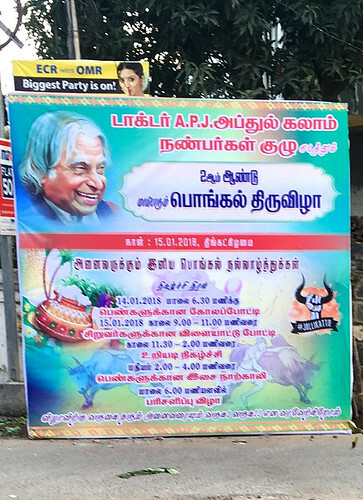 Pongal isn’t a religious festival to celebrate independently at home and some are so reserved to come out to show up cheers while sending greetings and I believe it’s celebration of nature and thanksgiving the farmers and cattle’s in supporting the production of food crop. 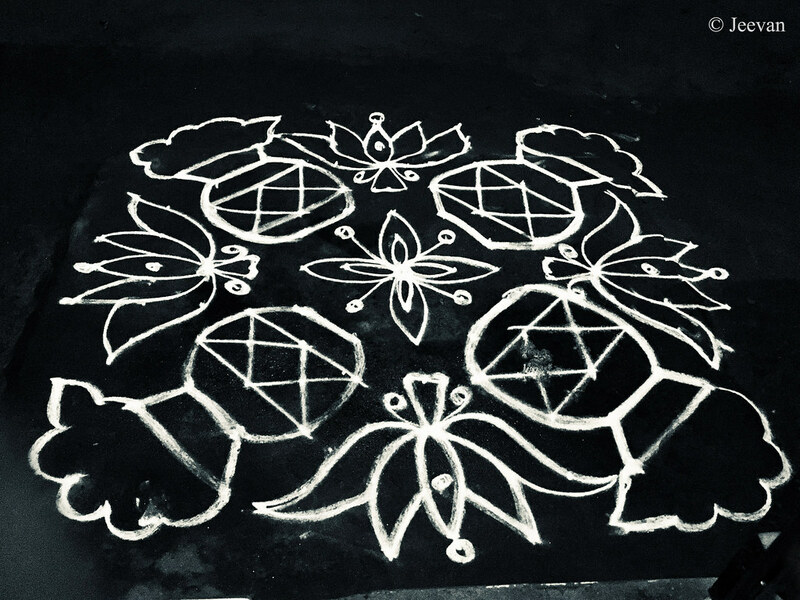 From night to morning mom drew 4 kolam along the courtyard and gateway, two before went to sleep and two at early morning. 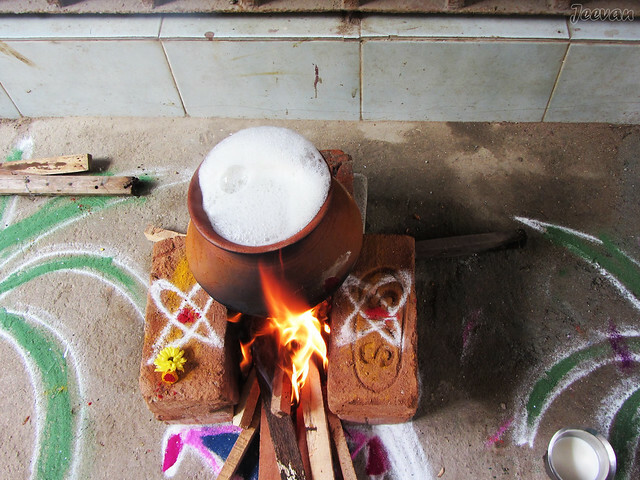 I will make a post of it later and here you could see the Pongal boiling/overflowing out of the pot. 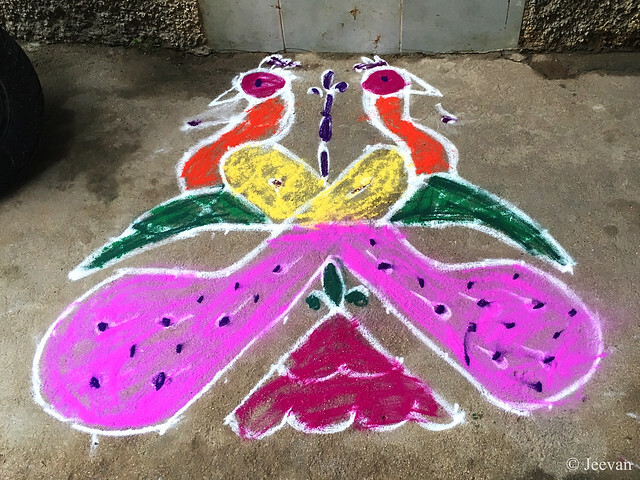 The days of Pongal passed by watch few movies and TV shows, and alike last year I went around our streets to check neighbours Kolam, but couldn’t see many unlike previous Pongal. 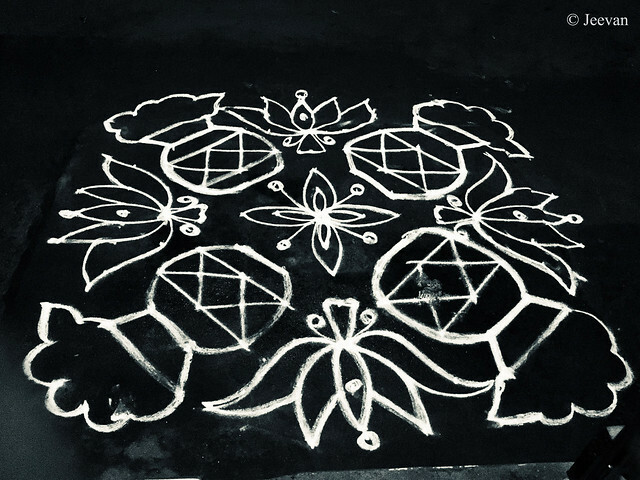 The first photo here was the Kolam of my nearby neighbour, though it’s not a colourful kolam, I like the beautiful pattern and neat finishing from this young lady. The backstreet boys conducted Pongal festival contest, just like last year on Mattu Pongal day instead on Pongal and being a weekend along with festival many were out of town and it wasn’t interesting though and contests also went on untimed for people to participate. Kolam is a south Indian tradition and Tamils made it an everyday custom to draw patterns in front of the houses and Margazhi is a Tamil month (between Dec-Jan) where Kolam takes special attention and ends with Pongal, the harvesting and thanksgiving festival of Tamil. 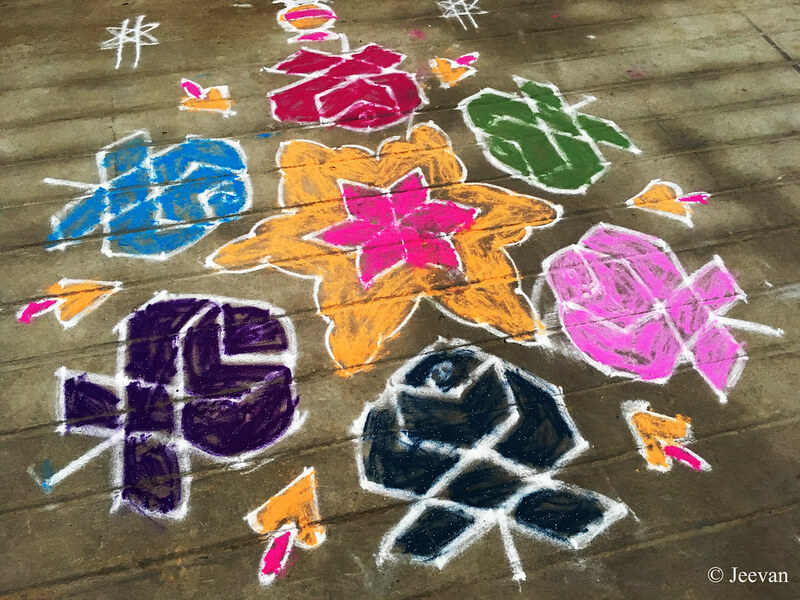 Pongal Kolam is popular during this time and many put great efforts to make it look wonderful and colourful including drawing something relevant to the festival. 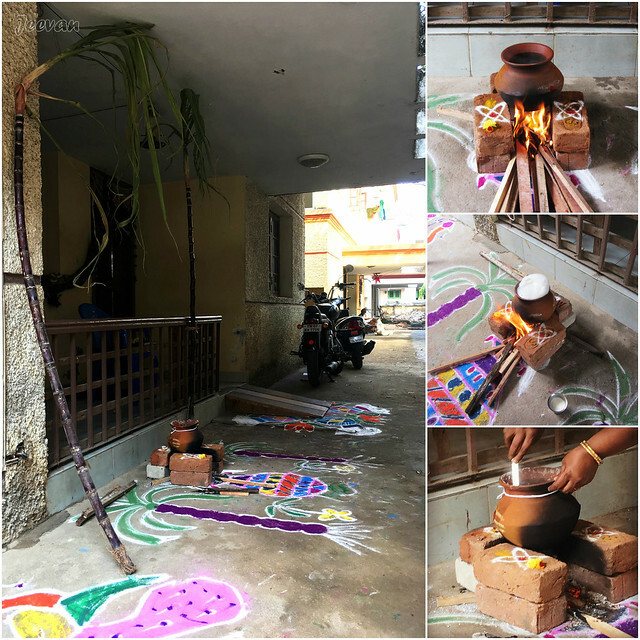 Today marks the first day of the Pongal, called Bogi Pongal, and it’s a favourite festival among kids till late 90s where people light fire in front of the house and kids sit around and enjoy beating little skin drums, heating up from the fire. Usually it’s the worn-out things (from home) that put into fire, like rush mats, winnows and broomsticks the most. 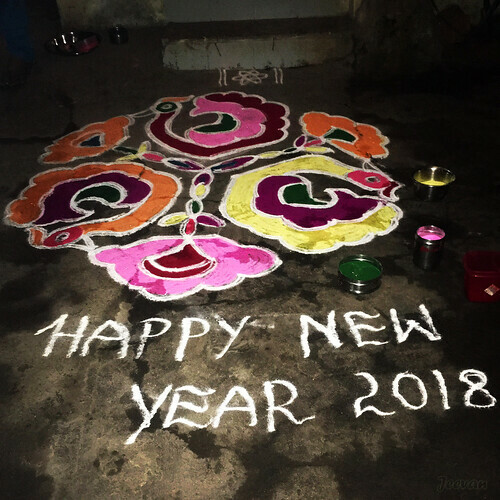 It’s a festival adapts nature way of celebration and what we fire is all natural elements, that carries less evil to nature. But it wasn’t same in later years, when people started to fire anything from plastic to tyres it becomes a cause for concern. Apart that, Pongal is an auspicious festival that bring hope to life and being a harvesting festival, nothing could bring hope and cheer to life when farming is the base of food and we couldn’t stop thanking the farmers and natural sources that help us living, healthily. 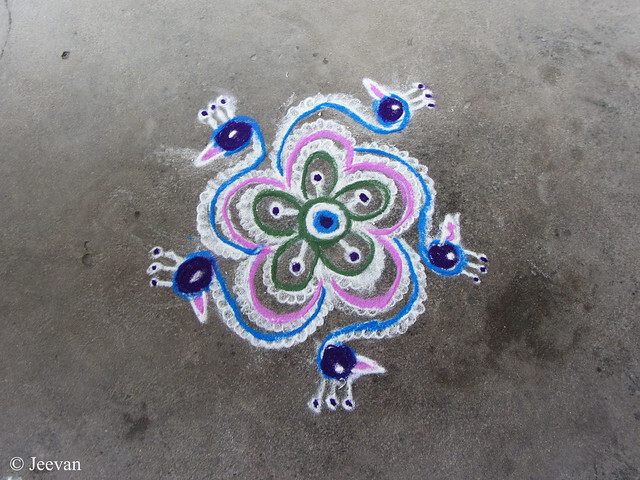 Coming to Kolam, I always admire the art made on the floor and apart my mom, aunt and grandma also make lovely designs and the critters (cat and peacock) here was drawn by grandma. 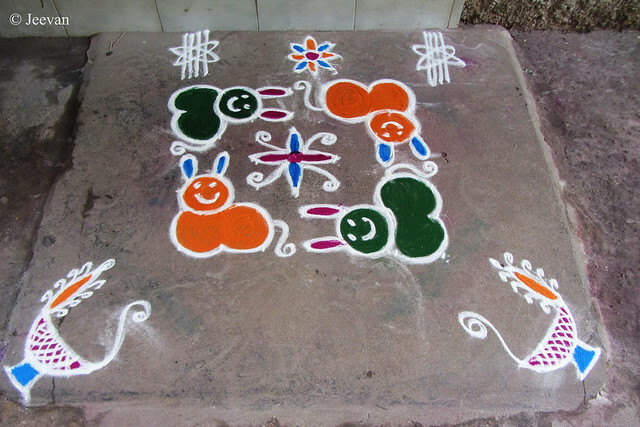 Though these are simple ones it bears a cuteness I loved. 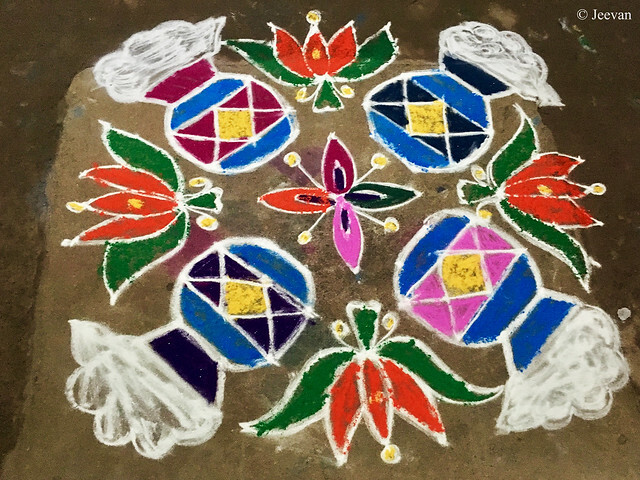 Every year mom draw one or two colour Kolams for Pongal and I have no idea what she planned to draw this year and I would post that after the festival. I wish people a Happy Pongal! Back on my travel experience to Munnar, and like I told in my earlier post on same it was drizzling or slowly showering as we moved out of the Udumalapet guest house. 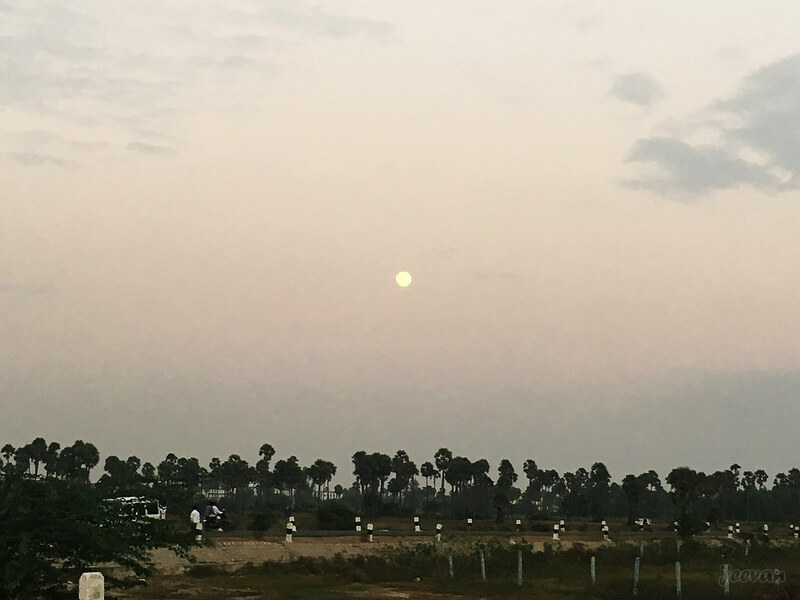 As we loved the taste of the dinner from Hotel Ariya Bhavan there, we hadn’t anything to choose for breakfast and as I want to be around the Tiger Reserve as early possible we took parcel from the hotel and ate before we enter the forest area. 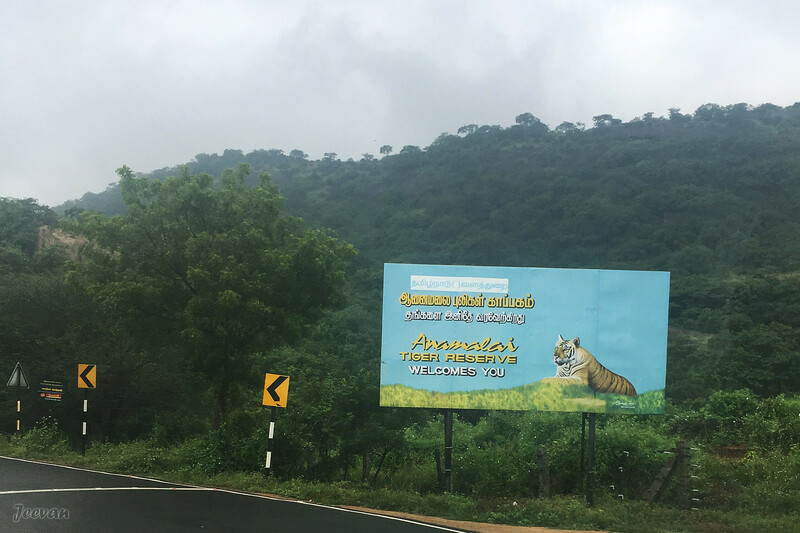 The Anamalai Tiger Reserve here comes under Amaravathi division, which is a part of the Anamalai Hills, a range of mountains in the southern part of Western Ghats. I have been to the other parts of Anamalai Tiger Reserve, including the tourist attracts Topslip and Valparai and I have even went to Amaravathi Dam and Crocodile park adjoining the Tiger Reserve. A ranger whom we met here took us on a brief ride into the forest when checking Amaravathi Nagar in 2008, but since I know the road from here goes to Munnar, I wanted to take this road when I travel to same. 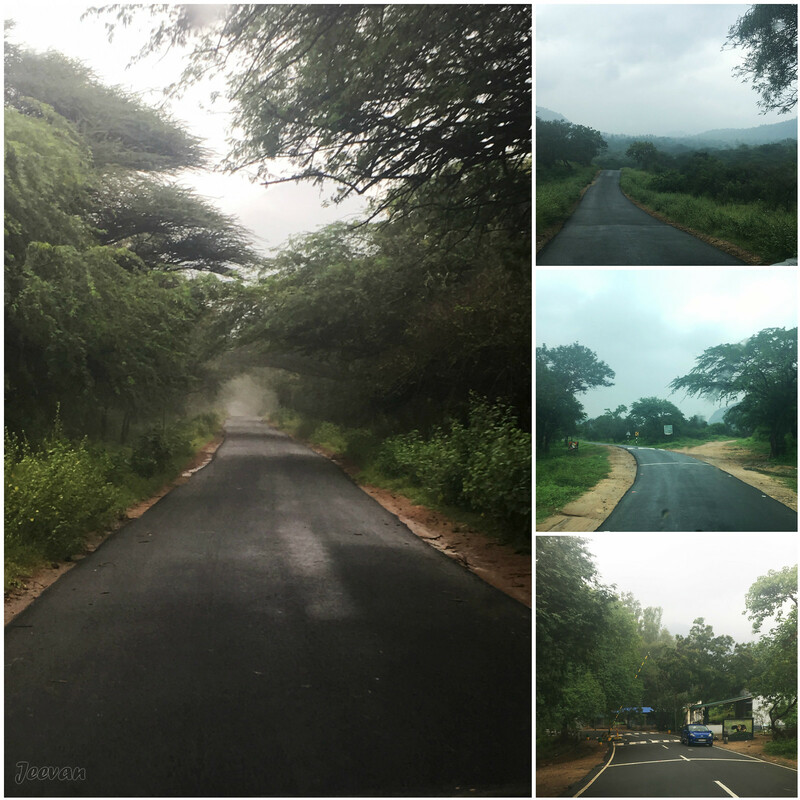 Actually it become a dream for me to take this road, as it passes through two wildlife sanctuaries, it would be a great opportunity to see wild animals at their abode. I want to be there early in morning so that more animals could be sighted, but we couldn’t make up before 9 am, the time we reached the forest check post. While dad went to sign the register, the guard who came checking the car protested for taking our pet dog into the tiger reserve and he insist for veterinary certificate to give permit. We are told that allowing outside animals have a risk of spreading disease to other wild animals, if the one have any and the veterinary certificate is must to ensure the dog is healthy. But his higher officer just instructed to not let down the dog anywhere until moved out of the tiger reserve. We could understand why they are strict with outside animals but we haven’t faced anything like this earlier even though we have stayed in Topslip (one of the core area), Valparai and Cloud Mountain with high fauna. We aren’t complaining anyway but rather happy that forest department is conscious in preserving the wild animals and this would help us be cautious in future travels with dog. The entire stretch of tiger reserve was wet and drizzling with haze, though the weather was pleasant it don’t give hand in spotting wild animals, perhaps they too don’t like dampness or hideaway in absence of sunlight. They told only in evening animals come into sight mostly or should be early in morning, but this unusual weather of showering and fog kept away the little opportunities. We encountered only couple of vehicles in opposite and few overtaking us, as we drove slowly, the road was far empty. The Anamalai Tiger Reserve is a blend of wet evergreen forest, marshes and grass lands covering a total area of 1479 sq. km includes a core area of 958. Sq. km and Amaravathi cover 172.5 sq. km. 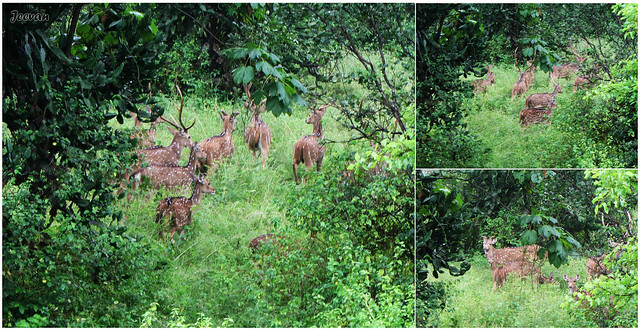 Within few kms into the forest we saw a herd of Chital, aka spotted deer, staying and staring from the thicket. My cousin has keen eyes for deer, and alike many a time; he spotted the deer which could be easily missed. It looked like a family of deer, from fawns to well gown with big antlers. 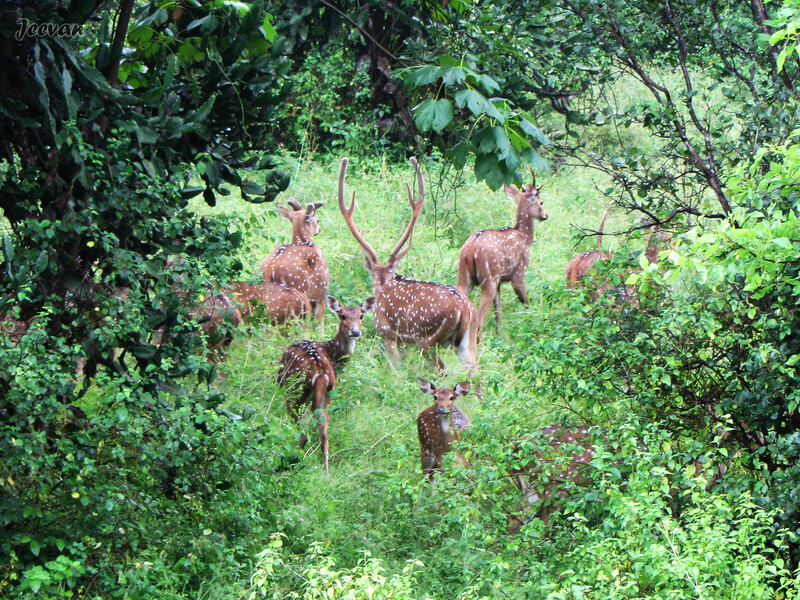 They stared at us for few seconds before turn their attention somewhere and marched forward. Where there’s lot of deer means a favourable circumstance for tigers, while deer’s are there favourite prey and according to the census the tiger reserve is home to 32-36 tigers. 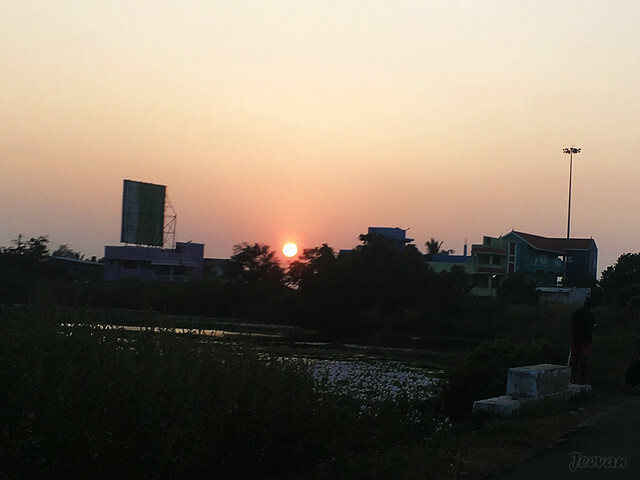 Few kms from there the backwaters of Amaravathi reservoir come to sight. Perhaps due to less water, it looked like swamp and guess animals would come visiting this place to drink water or feed on vegetation. Our next stop was an encounter of vultures prey on some flesh at distance. First thought it was peahens but they haven’t look alike and this is the first time seeing vultures in wild. As we near the border check post (between Tamil Nadu and Kerala) found some peahens around grazing buffaloes, which we though was wild ones but realized soon it should belong to the people around check post. The Chinnar River that crosses here marks the border between the two states, from where the Chinnar Wildlife Sanctuary begins – which could be my later post. 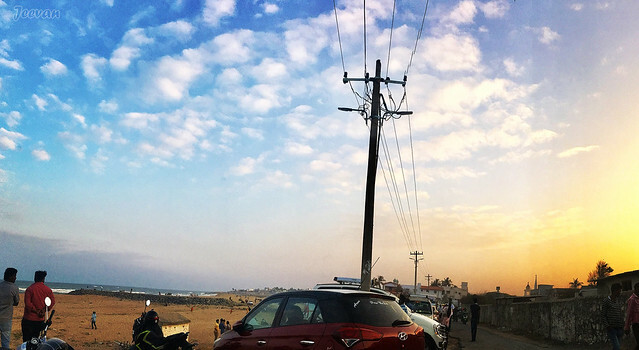 Picture shot at neighbourhood. 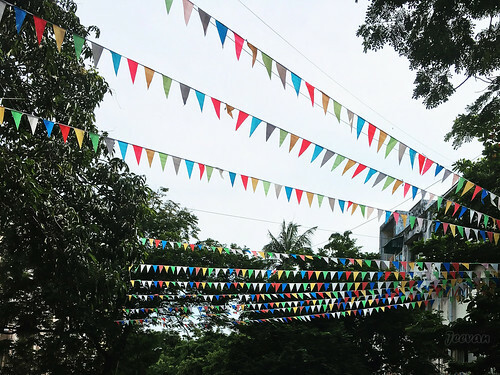 And these kinds of flags are tied during social events and festivals to create a celebration mood and to mark the event. RGB Monday is a meme created to keep away your Monday Blues and make feel colourful and yet cheerful! Though GauthamMenon decided to give chance to a new comer rather following his usual Harish and ARR formula, the songs carries a similar scent or accent (which seems to ever wither) bearing the stamp of formers. More than watching the video I love listening from home theatre.